Order one for each HI office and location to be fully compliant. The OSHA poster is included on the Hawaii Complete Labor Law Poster. When you order the Hawaii Complete Labor Law Poster, it will satisfy your State, Federal, and OSHA posting requirements with one poster. 12/2017 - Minimum Wage Poster - Updated with the addition of sibling as a protected class for use of family leave. 12/2017 - OSHA - Updated with new layout and additional information regarding OSHA, added logo and image. New address and phone number. 07/2014 - Minimum Wage Poster - Updated to reflect new 2015 minimum wage rate of $7.75 per hour, effective January 1, 2015. In addition, the minimum wage rate for 2016, 2017, and 2018 is also indicated on the Hawaii Minimum Wage Poster. 11/2013 - Breastfeeding in the Workplace - New poster to inform women of the right to reasonable accommodations during pregnancy. 11/2014 - Unemployment Insurance - Update includes new instructions on how to apply for unemployment insurance. 06/2012 - Military Leave - Omission of website. 05/2012 - Unemployment Compensation - Includes new telephone number listings, email listings and new hours of operations. 03/2012 - OSHA - New update extending coverage to employees working on military installations. 02/2012 - OSHA - New penalty amount fines for workplace safety violations. 01/2012 - Minimum Wage Poster - Updated website address. 05/2011 - Military Leave - Minor updates made to content. 04/2011 - Workers' Compensation - Updated to reflect the current director. 04/2011 - Unemployment Compensation - Updated to reflect the current director. 04/2011 - Military Leave - Updated to reflect the current director. 04/2011 - Minimum Wage Poster - Updated to reflect the current director. 04/2011 - Dislocated Workers/Plant Closing - Updated to reflect the current director. 04/2011 - Whistleblower Protection Act - Updated to reflect the current director. Many industries such as the restaurant, retail, construction, and professional use the Hawaii Complete Labor Law Poster to satisfy their compliance requirements for State, Federal, and OSHA. When posted in an area frequented by employees, the Hawaii Complete Labor Law Poster puts a business in full compliance. Federal contractors and subcontractors are required to display more postings in addition to the general State, Federal, and OSHA regulations. Please click here to see the federal contractor and subcontractor posting requirements. 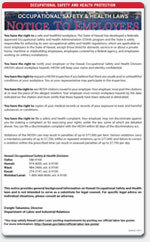 Ensure your full compliance by posting the Hawaii Complete Labor Law Posters with the federal contractor-required postings.